Formed in 2011, Pompton Lakes is the musical union of Jeff Martin, Dan Desrosiers, Isaac Strader, Vinnie Lupoli and Dennis Archer. Previously, Jeff Martin had been the frontman for the rock band This Day & Age from 2001-2007, and so brings a wealth of experience to Pompton Lakes. 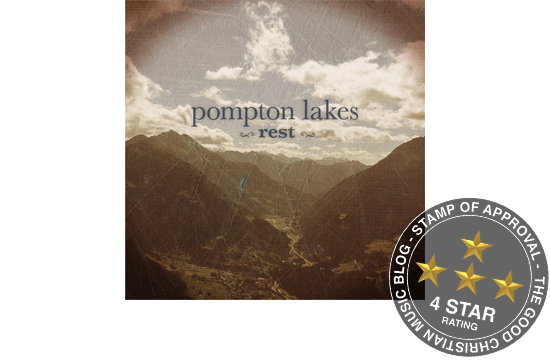 Listening to Rest, it’s clear that despite this being Pompton Lakes‘ first release, the band have truly found their distinct sound as the album – though varied – does have a strong coherence from start to finish. Comparable to bands such as Death Cab For Cutie or (Pre-X&Y) Coldplay, Rest also brings to mind many Brit-Pop bands of the early 2000s, such as Doves, Feeder, Travis and Starsailor – just to name a few. Lyrically, Rest is a very intimate exploration into the singer’s relationship and perception of God. On songs such as Searching there is a real sharing of struggles, often not expressed in mainstream Christian music with lines such as If I don’t see anything, does it change who You are?/Can I be in Your house while I still have doubt? The opening track Home is also of a similar nature as Jeff Martin sings Lately I’ve tried to find hope/In places where I know it can’t be found. Other songs such as Trust could be compared to modern hymns with worshipful lyrics like – I trust in Your name/Lord, You are worthy of my praise/I don’t have much to give/But what I do, I offer it to You. Though worshipful in lyrics, by sound alone you could quite easily not notice that Pompton Lakes are praising the God they very much love if your only experience of worship music is from a contemporary church service. However, this is still an album that can be appreciated by anyone, regardless of faith. As Christians all that we do is considered worship, and so though the album isn’t always ‘Worship’ music it still seems fitting to give it that label because it’s clear that this album is all for God’s glory. Rest is an excellent debut release by Pompton Lakes, and I feel that they have a lot to offer to not just the Christian music market but the music scene in general. Hopefully, there are more albums to come from this band but for now head over to iTunes or Amazon and get yourself a copy of this brilliant album now! Album Highlights: Home, Merciful, Trust and Hope (Banjo Song).